If you work the angel with size 10 thread and a size 7 steel hook it will be about 1.75 inches. Thanks you Sally for the information. Thanks for the Angel Bookmark pattern. This will be a perfect gift for a friend of mine who collects Angels. Beautiful pattern! I've never heard of vinegar and water to block. Is it like starch - does it make it stiff? I love angels! Thanks for a great pattern! It doesn't make it stiff, just gives more body than with out. This is such an adoreable pattern. I am an experienced crocheter, but I don't understand the wings. The sc, hdc, dc, etc all go in the 2nd sc from hook, then 6 sc across chain. Twist? and slip stich - this is the part I don't understand. The stitches are worked across the chain not all in one chain. I worked on that this morning, I apologize, but it's the "twist" that I can't seem to work smoothly. I'll try again later this afternoon. Thank you. This will be the perfect accent for the Debbie Macomber "Where Angels Go" book I purchased for my Mother. Your crochet patterns are unbelievable and beautiful and fun. I am a beginner crocheter and also having problems with the angel. If I do the first twist, both wings end up on the same side, if not one wing is backwards. I have MUCH problems reading directions. Can you help? Only twist it enough to work the slipstitch in the "neck". I would like to learn how to make this. IS there a way that you can videotape it being made so i can learn that way? came across your site a few weeks ago, it is wondeful, thank you for taking the time to share with everyone,im a novice crocheter and have dyslexia but i will persevere till i get it right for your crochet pattern thanks again. I really like your angel. I wish I could crochet. It is very nice of you to share the pattern with those who can crochet. Hi there, I would like to ask your permission to make some of these lovely, lovely bookmarks for a Church fund-raiser to help my friend's mom with the cost of the Chemo needed to help beat her cancer for a second time. There will be no financial gain for me personally, and none other than that towards the chemo. I hope you will grant me permission but if not, I understand. Thank you for considering this request and for sharing your wonderful patterns. Diana, you didn't include an email address so that I can answer your question. hi Suzie...this is such a cute bookmark pattern. Thanks for sharing. I am trying to make one but struck with the wings part. I am quite new to crochet. Can you explain little bit in detail (sc across the next 6 chains) where exactly i need to do sc? do you mean i should do it on 6 chains made from hdc dc and tr? if i do so then i end up at the tip of the wing that is so weird. can you please help me to understand this? I love to put a little something handmade in my Christmas cards ans this is perfect. I made one in no time at all. I did change the tail cause I was doing something wrong. THANK YOU!! 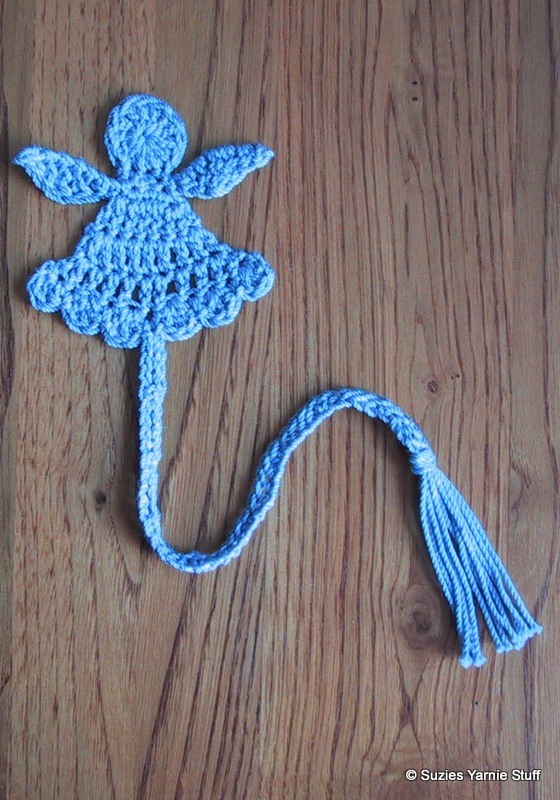 Just made my first little angel from your lovely pattern, thank you for sharing this! I am planning on making a few more to give as little presents at Christmas for relatives and friends..
so beautiful.... thank you for sharing your pattern. This is a delightful little idea and pattern. I had problems with the "twist" aspect of the wings also, but adlibbed and twisted the wing so that both right sides faced frontwards somehow and it looks great (now if I can do that again, lol). Thanks so much for sharing the pattern! Yes you may post the translation. Please include a link to my blog in your post. Love this little angel. Just don't understand what "twist" is all about? Baffled. Please explain, fully, for folks like me. Thanks so much. Marla. The twist aligns the previous work so you will have the wings oriented correctly. Yes you may make them for that purpose. I'm always pleased when people use my patterns for charitable causes. Suzette, could u Please answer Su's question. I am having the same problem she is. What do we do with the 6 sc? WINGS:1st wing: Ch 8, sc in 2nd ch from hook, hdc in next ch, dc in next ch, tr in next ch, dc in next ch, hdc in next ch, sc in next ch. This angel is beautiful. It will be a christmas gift for my younger sister. Suzie - Thanks for the pattern! I translated it into German and blogged about it (http://bit.ly/1v126jI). Are you okay with that? Thanks!! Carina. Glad you like the pattern and translating it is super. can i sell items made out from this pattern? Permission for online sales will not be granted. Thank you so much for this adorable Angel Bookmark!! I was thinking that if you leave off the tassle & put a string through the top of the head, they would make adorable ornaments for your tree or cute package trims. Could I have permission to donate some of these to the local school band for their annual auction? For the wings: the last stitch for the wing reads "sc into the next 6 chains" but when you are trying to explain it to those who don't understand (which I was one) you say "sc into the next chain". I think how it reads in the pattern very confusing as I do with the twists. I have found a way to do the angle and it turned out beautiful. Thank you for the pattern. Love this pattern and the others you have posted (star, Christmas tree, etc. ) made a mix of them for my children's peers. Would love to know how to make them hard. Any thoughts?? I like to use liquid starch (Vano). I have friends that use Elmer's glue diluted with water. Thank you, I am going to make these for a small token of appreciation for my Red Hat group. Thank you for the pattern. Some crocheters have had problems with the turning for the wings, but if you don't over think it it is an easy project. I'm having trouble with the tail. Ch4 skip 4 sts. Sc in 4ch ?? *Ch 4, skip 4 sts, sc in next ch. I think you must have misread the instructions. For the wings, I don't understand the " sc across the next 6 chains". If I complete the previous stitches, there aren't any next chains left? hdc, dc, tr, dc, hdc, sc Those 6 stitches aren't all made in the same stitch but across 6 stitches. I'm sorry, I'm fairly new at this. I do the hdc, dc, tr, dc, hdc then this is where I am lost. Am I continuing (around) onto the starting chain with the next sc x 6? It seems like it makes the wing into more of a circle when I do this. Yes you are work the other side of the chains. Please read the whole pattern and you will see after the 6 sc you will be at the neck. Once working these stitches,did you then single crochet on the other side of the wing. If you work the stitches throughout the chain there are no chains left to single crochet in the next six chains. Please clarify. I got it figured out, thanks Mary! US terms. An easy way to tell is if you see sc (single crochet) is is US.